There's a text screen before every mission in Resonance, which I linked previously. How do I change the names of missions that are displayed when one selects an episode to play? Simply renaming the map files doesn't seem to be enough. Also, how do I change the text of the buttons of the game menu (Like "Save game" and "Exit program")? This particular section of the campaign information resides inside the rez\gluhist.tbl file (gluhist.xml for Remastered). It is independent from both the actual mission information set in Staredit (if you create the campaigns it is actually ignored entirely, that's why in vanilla there are some missions with nonexistant or nonsensical/silly map-side descriptions) and the splash screens that are defined by rez\EstR##(x).txt files, where R is race (P, T, or Z), ## is the mission number and "x" is there for the Brood War missions. So the way I handle the individual files in the .MPQ is to extract the files I want to edit, edit the extracted version, delete the original, then put in the version that I edited. For map files, this worked fine. However, this didn't work for the rez files. I edited the rez and the gluhist files and put the edited versions in the MPQ. I then double-checked to make sure that the files that I put in are the translated versions. They were. However, when I run the game, the splash screens and the mission names are still in Hungarian, eventhough the rez files are in English now. What's happening here? I even tried reinstalling Huncraft and then replacing the MPQ that gets installed with the partially translated version and restarting my computer, but to no avail. Post has been edited 1 time(s), last time on Feb 10 2019, 12:01 am by Kolokol. 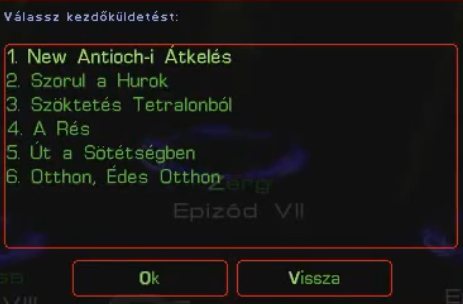 Huncraft seems to only have one standalone MPQ and one set of rez files, all of which are in Hungarian (Which is also the language used in the game). So yes, I do think that I'm editing the correct versions. Ugh, oops. So it turns out that, unlike the scenarios, the rez files in the standalone MPQ aren't the ones used. I found out that there is another MPQ file hidden in the huncraft.exe itself with another set of rez files, and these are the ones that matter. I can edit the splash screens just fine now. However, after every campaign is an epilogue text screen. I tried editing that by editing the rez files in the .exe and the standalone .mpq, but no such luck. What else could be responsible for those? Go to the 1:01:47 mark to see what I'm talking about. Post has been edited 1 time(s), last time on Feb 12 2019, 8:16 am by Kolokol. Original and modified version are attached. Post has been edited 1 time(s), last time on Feb 12 2019, 8:28 am by Kolokol. Hmm... you really should be using a TBL editor for that (I'm on Remastered now so I have no such problems since the XML format is now used but I know the issue. Ok, it took some time for me to find a good editor, but the mission names are fine now. Now, how can I deal with the epilogue issue? Here though it looks like they rendered it as a video and replaced the finishing cinematic of the Protoss campaign (smk\XProtoss.smk). Hence the voiceover. Hmm. Do you know of any free software that can edit .smk videos? Get the RAD video tools, it's been years but I think they support SMK format as well as the newer BINK. It's the default tool from the company that made the SMK format, after all.